Albert Emmanuel Allx Dieudonne Jean Ghislain van den Hove d’Ertsenrijck was born in Charleroi, Belgium in 1908. He attended St.Louis School in Liege and then St.Michel School in Brussels. On 3rd December 1928 he joined the Belgian Air Force, firstly carrying out basic infantry and cavalry training as part of the 74th entry then moving to the air force itself on 26th December 1930. His first posting was to 11/V/1 at Evere on 1st July 1931 as an Observer. He then went to the aviation school at Wevelghem on 15th December that year for pilot training, passing out on 30th September 1932. His first pilot posting was to 2/I/2 ‘Thistle’ squadron, operating the Fairey Firefly. He married on 19th September 1933. Promotion to Captain followed on 26th December 1936 and he took up instructing duties at Ostend on 28th December 1938. On 26th August 1939 he was able to return to his old squadron, now at Schaffen and equipped with the new Hawker Hurricane. The squadron was coming to readiness on 10th May 1940 when successive dawn attacks by Me110’s destroyed all but two of the Hurricanes, only van den Hove and one other being able to take off. Van den Hove intercepted a raid by twin-engine bombers on Brussels and damaged one. He went on to land at Beauvechain where his aircraft was destroyed on the ground the following day. There followed a chaotic withdrawal by road and train to the south of France, where it was intended that they should re-equip at Mauguio near Montpelier and continue the fight. On the 19th June the senior Belgian officer announced that they were expected to surrender, van den Hove and several others decided to ignore this and make their way to England. They took two vehicles and some mess funds and set off for Port Vendres near the Spanish border. Ludicrously they were branded as thieves and deserters by the Belgians, these charges only being dropped in 1948. With the assistance of Royal Navy officers and the Belgian embassy in England they were able to board the SS Apapa and leave as part of a convoy on 24th June, arriving at Liverpool via Gibraltar on 7th July. 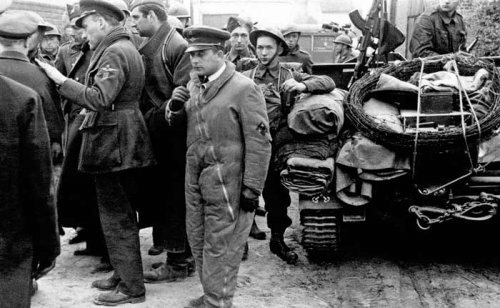 Their next stop was the Belgian reception centre at Tenby. 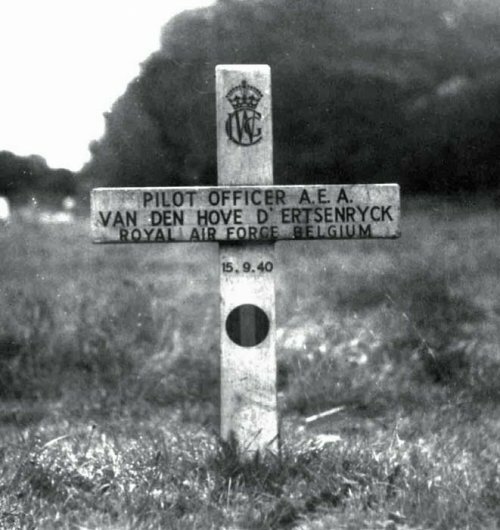 Van den Hove, who could speak little English, was commissioned in the RAF on 19th July and sent to 7 OTU Hawarden on the 21st. He was posted to 43 Squadron at Tangmere on 5th August. He claimed a Ju87 destroyed on the 16th, a Me109 on the 26th and a Me110 on 4th September. In this latter combat, his glycol tank was damaged and he made a forced-landing at Ford, following a mid-air fire. 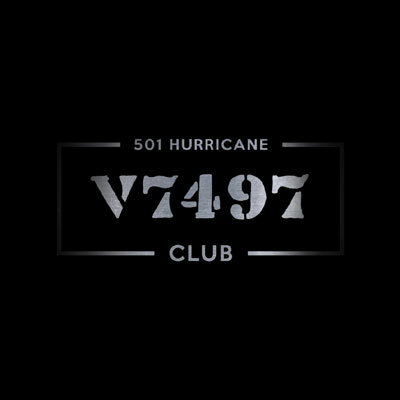 501 Squadron – On 11th September van den Hove was posted to 501 Squadron at Kenley. On the 15th, his first patrol with the squadron, he was shot down by Me109’s during an attack on Do17’s. An eye witness saw his Hurricane, P2760, attempt a forced landing in a meadow adjacent to the River Stour where it passes through Olantigh Park near Wye in Kent. Realising that the aircraft would not clear the trees bordering the river, van den Hove was seen to be leaving the cockpit with his parachute unstrapped but fell dead in the river after falling through the branches. Van den Hove d’Ertsenrijck was 32. He was buried in St. Stephen’s churchyard, Lympne, Kent. 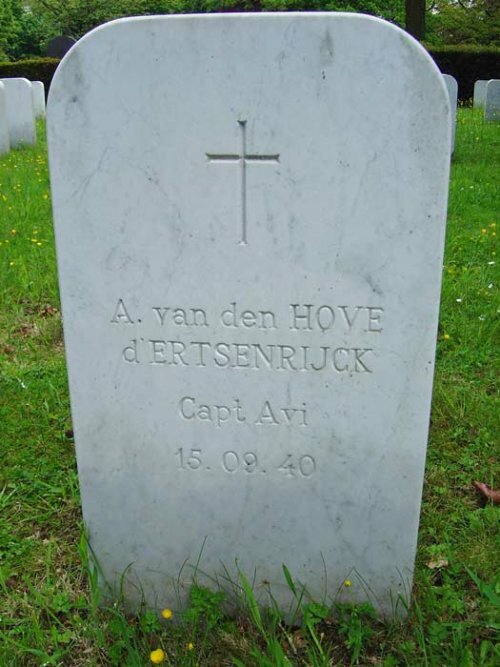 On 20th October 1949 his remains were exhumed and re-interred in the Pelouse d’Honneur Cemetery of Brussels at Evere. 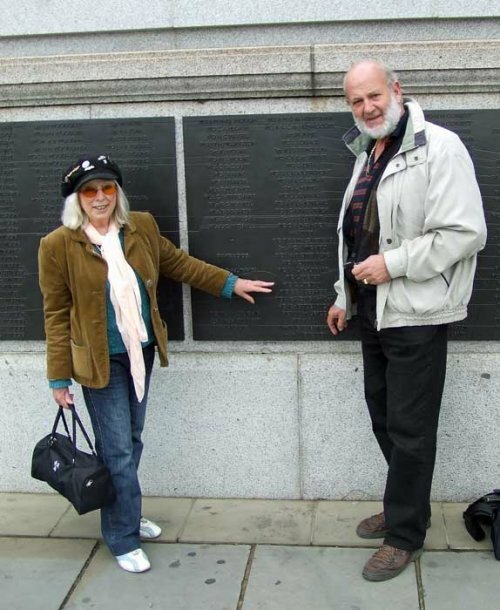 In August 2010 van den Hove’s daughter Adrienne Lecoeuvre and her husband Philippe visited the monument to see her father’s name inscribed (below).